1970 Top 20 Hits. . We know it is difficult to discover that memorable 1970 anniversary or 1970 birthday gift. 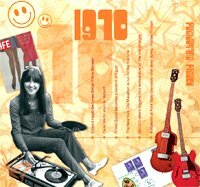 However, we think that with this CD/Card, featuring music of 1970, will make you the star of the party! People will start swaying with these 1970 top hits as they think of times go by! Our 1970 song list includes: American Woman (The Guess Who), Angels Don�t Lie (Jim Reeves), Black Magic Woman (Santana), Bridge Over Troubled Water (Simon & Garfunkel), Don�t You Know (Butterscotch), Everybody Go Home The Party�s Over (Clodagh Rodgers), I Don�t Believe In If Anymore (Roger Whittaker), It�s So Easy (Andy Williams), Johnny B Goode (Johnny Winter), Lay Lady Lay (Bob Dylan), Lucretia Mac Evil (Blood, Sweat & Tears), Mississippi Queen (Mountain), Natural Sinner (Fair Weather), Nobody�s Fool (Jim Reeves), Ruby Tuesday (Melanie), The Wonder Of You (Elvis Presley), Wedding Bell Blues (Fifth Dimension), What Is Truth (Johnny Cash), Yellow River (Christie), You Better Think Twice (Poco). Twenty 1970 songs in all! See also our other 1970 gifts.